The highest rated RV Park in Corpus Christi. Padre Palms makes your RV experience with us easy as well as affordable. A quite and convenient mobile home and RV park. No matter where you’re coming from, or when you’re coming, Corpus Christi is THE vacation spot. Located on the Texas Gulf Coast, Corpus overlooks the Gulf of Mexico and offers not only water attractions, such as Dolphin Connection, but all the amenities of the “Big City.” Things like fine dining, first rate shopping and over a dozen golf courses to choose from. After just one visit, you’ll agree that Corpus Christi is a wonderful vacation destination. 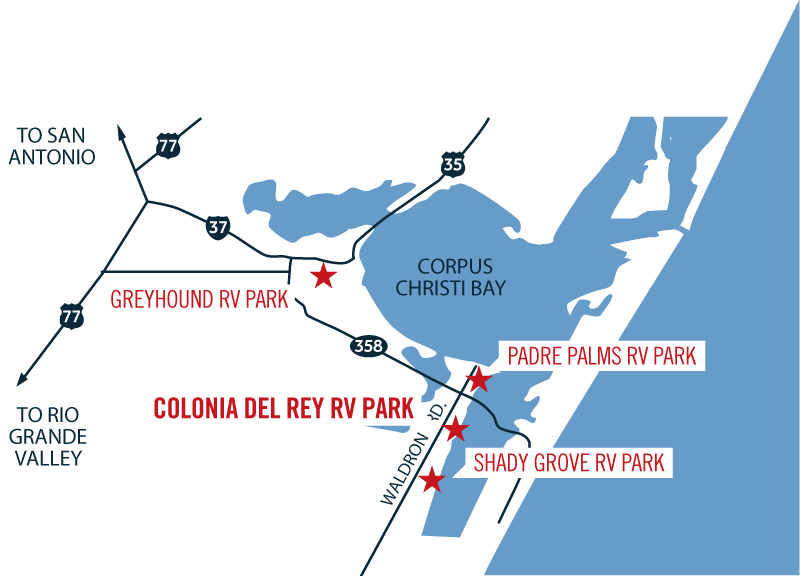 Colonia del Rey is the highest rated RV Park in Corpus Christi with great amenities…. Padre Palms is a short walk from a huge, lighted pier and sports comfortable RV sites. CCRV Resorts, 4 RV Parks, Same Great Service. When you visit Corpus Christi in your RV come and see us at Corpus Christi RV Resorts. We offer first class service and affordable prices. Our four RV parks are conveniently located on or near the fabulous Corpus Christi Bay. One of them, Colonia del Rey RV Park, is the Highest Rated RV Park in town and carries the Best Parks in America designation. Our other parks, Greyhound RV Park and Padre Palms RV Park, are all Good Sam Parks. After setting foot on any of our locations, you’ll never want to stay anywhere else. Stop putting your dream vacation off until next year and come experience paradise at any one of Corpus Christi RV Resorts. Couldn’t ask for a better place. Price is just right, a good quiet park which is good because my husband is working nights. Management is super friendly and helpful. Park is clean, taken care of, pet friendly. Laundry room is excellent and everyone is super friendly. Wifi and cable free. Plus the bay is right in the back yard perfect to take the dog and go fishing. To make a reservation at one of our parks, click on the reserve now button and you will be directed to our reservation page. Ask Us About Discount Tickets!